A prerequisite to becoming a great computer coder is the ability to think algorithmically. Prior to learning a programming language or soldering hardware, the individual must have an ability to see and think in systems. “Playful Calculation” is a formal method to build foundational algorithmic thinking skills. By teaching students how to create algorithmic rules and schemas in their art process, we are providing a more flexible and intuitive entry point to integrate technology in art education. This chapter examines a case study carried out at the Boston Children's Museum in Boston, MA. In the study children were allowed to play a game in which algorithmic thinking was introduced through the manipulation of physical geometric shapes. The research documents the play process of children and demonstrates how they invent rules and procedures to carry out a creative task. The game itself can be understood as tangible coding for visual thinkers. While most abandon play in adult years for the “seriousness” of life, in some progressive circles play is once again emerging as an element that impacts learning. A movement in the development of “Learning Games” has become a valuable area of research that seeks to analyze game play as a way to understand certain phenomena around knowledge acquisition (Gee, 2003). Observing game play becomes a great way to understand the way people learn because it involves structured rules, flexible intuition, and meaningful decision making. If we are to bring technology in the K-12 art curriculum, play might be the best path to travel. In this chapter we discuss an expanded perspective on what it means to “calculate.” We will introduce key ideas from the field of shape grammars (Stiny, 2006) and present how visual calculation can be a valuable way to introduce children to thinking algorithmically. All of this is further demonstrated by a study conducted at the Boston Children’s Museum. Here we tested and observed a game that we created to see how children calculate with their eyes as they create artistic compositions. The game will be further analyzed in the chapter to be understood as a valuable teaching tool that uses game play to unlock the potential of algorithmic thinking in the arts. 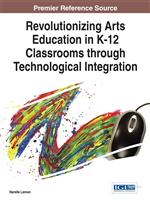 It has been suggested that “play” is essential to any creative endeavor (Brown, 2009; Singer, 2011); so when we talk about technology integration in art education, play must be an essential component. Johan Huizinga (1950) refers to the phenomena of play and play space as the “magic circle.” The magic circle transcends the player(s) into a mode of thinking and behaving that allows them to behave differently than they would in an active state outside of play. Within the magic circle a broom can become a horse; a stick can be a sword. Roger Caillois (1961) further defines Huizinga’s definition of play with six unique qualities; play is: free, separate, uncertain, unproductive, governed by rules, and make-believe. When people are in play they are in a heightened state of imagination and creativity. A learning experience that is playful is a more meaningful learning experience than that acquired by information dictated from a teacher. Traditional elementary and pre-K art education has lead the way supporting the play pedagogy (Eisner, 2002; Hetland, Winner, Veenema, & Sheridan, 2007), but often curriculums for STEM subjects (Science, Technology, Engineering, and Math) are void of the play element. As art educators look to adopt new technologies into art education curriculums, they should pay special attention not to lose the pedagogy of playfulness that has lead the way for innovation and creativity in the arts. The educator is responsible to set up a playful learning environment. Thomas and Seely Brown (2011) state that, “when play happens within a medium for learning-much like a culture in a petri dish – it creates a context in which information, ideas, and passions grow” (p.18). Children do not learn best through direct teacher instruction, but through playful experiences (Dewey, 1934) that the teachers set up. One thing that could limit the extent which technology can be used in the art education classroom is the inability for art educators and students alike to design their own tools.